Most men don’t own a vast number of accessories. Often it’s a case of the bare necessities: a watch (so we’re not late), a scarf (so we don’t freeze in winter), a tie (so we don’t look scruffy) and a bag (so we don’t overstuff our pockets). However, unless you’re a man who enjoys forcibly squinting at the sun (or, indeed, damaging your eyes with year-round UV rays), sunglasses fit well and truly into the essentials category. A decent pair of shades not only protects your eyes, but they can also be used to hide a multitude of sins (i.e. hangovers), finish off an outfit, or create a style statement all of their own. So finding a pair that is just right is extremely rewarding. Of course, this all hinges on getting your head around face shapes and which sunglasses styles suit each – something we’ve shed some light on here. The only advice for oval face shapes (aside from avoiding novelty styles) is to sidestep frames with arms that hang too low, as this will elongate the face. As a general rule, the shape of your sunglasses should be opposite to the shape of your face. This helps to create balance by either softening harsh features or creating definition. For example, a strong jaw line and wide cheekbones add up to a square face. Therefore, in this case, rounded frames such as aviators and John Lennon styles look better than angular designs with sharp lines. Using the same rule of choosing a frame in an opposite shape to the face, guys with round faces should opt for sunglasses that create as much definition as possible. To make your cheeks appear slimmer, choose a style with a strong brow line in a size that is slightly wider than the head itself. Angular glasses will also help to elongate your temples and lengthen your face. To give a rectangular face a sense of balance, seek out glasses that add width to the long shape. Round or square frames work well here, but make sure you go for larger, even slightly oversized styles. 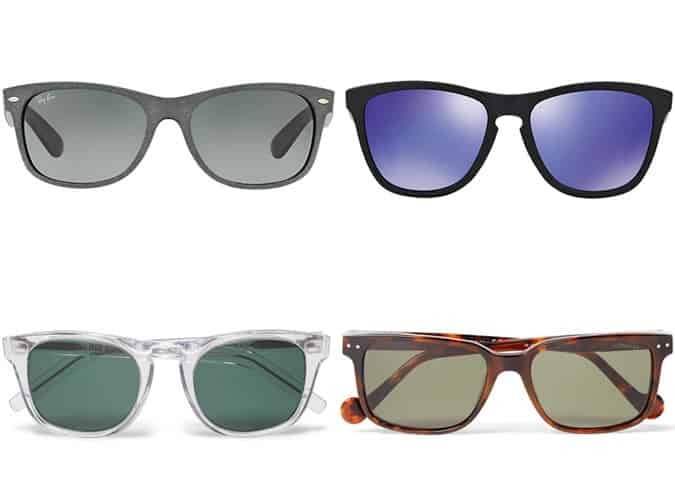 Wayfarers are a good option, as many brands offer small and large versions, allowing you to go big while maintaining the classic shape. Of all the faces, a heart shape is one of the most difficult to frame. Because a narrow chin is countered by a wider forehead, it’s important not to add extra weight to the top half of the face. Not an easy task when that’s where glasses sit. For that reason, opt for Clubmasters, which are semi-rimmed, or other rounded styles that add some curve appeal to a pointed chin. Try before you buy: there a number of factors beyond face shape that affect how glasses look, such as arm height (of the frames, not yours), colour and detailing. So it pays to test drive different styles in person. That’s not to say buying online is off limits; once you’ve found the perfect pair, make a note of the model number and shop around for the best deal. Consider your hair colour and skin tone: colour, whether on the frames or lenses, can be a fantastic way to inject some individuality into a look. But, as with clothing, certain hues can work against your complexion or clash with your hair colour. Experimenting is the only sure-fire way to ensure you make the right decision and pick the perfect sunglasses for you. Consider your hair style and length: unless you are clean shaven and sport a buzz cut, hair covers much of our head. So it’s important to remember that this has the potential to completely alter the shape of a face. Long hair can soften features while short hair will leave bone structure completely exposed. 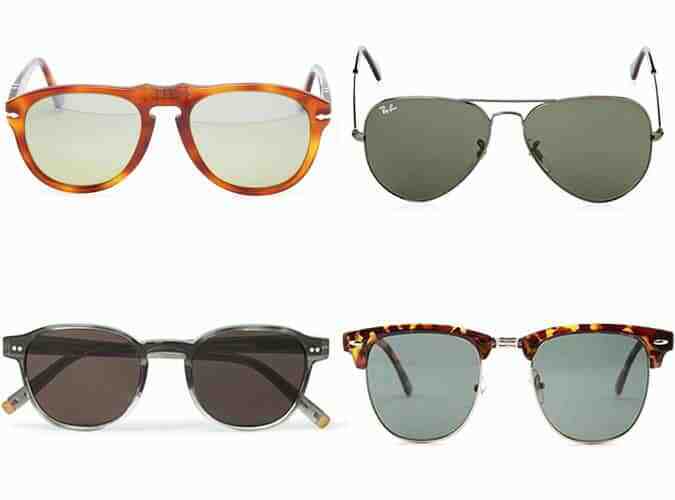 Remember the classics: classic frame shapes (think aviators, clubmasters and wayfarers) are considered such for a reason – they work and have done so for decades. Don’t be afraid to try a certain style simply because lots of other people are already wearing them. For a contemporary update, keep an eye out for updated or limited-edition versions of iconic styles. Invest: the best sunglasses brands are worthy of your hard-earned, so don’t be afraid to push the boat out. Better lenses, better build quality and a better overall look justify the extra cost and the right pair should last years. Cheap knock-off alternatives don’t look the same, don’t feel the same and probably won’t have the same protective qualities. Sports glasses are for sport: keep technicolour wraparounds for the slopes.